I am starting to write this blog on Thursday September 24th, two days after Pope Francis’ arrival to the United States, and the day after Yom-Kippur, The Day of Atonement; the holiest day of the year in Judaism. I am a Jew, which is reason enough for me to start a discussion with the Pope’s visit and the role of religion in shaping global events. 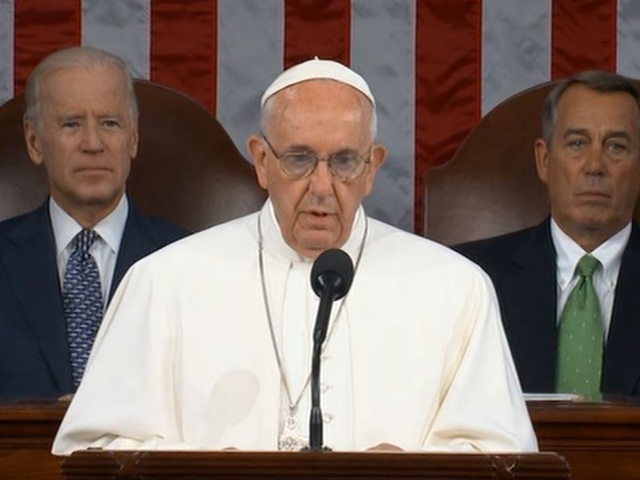 Today Pope Francis delivered his address to a joint session of Congress. As usual, this blog will be posted this coming Tuesday, two days after the Pope’s scheduled departure from the US. This week will be overwhelming dominated by events that have the potential to shake the world. In addition to the Pope’s visit to the United States, President Xi of China will be attending the opening of the United Nations’ 70th session in New York, along with approximately 150 other world leaders. The UN is expected to vote to formally adopt a global sustainable development agenda that will serve as a foundation for the upcoming Paris meeting on climate change this December. To cap it all off, Speaker John Boehner just made a sudden announcement that he will soon resign. The Pope is the spiritual leader of 1.2 billion Catholics. President Xi is the leader of a nation of 1.4 billion people. Each number represents close to 20% of the world’s population with very little overlap. Together they represent close to 40% of the global population. If humanity is in need of major global change, what these two leaders say and do is important. If they call upon their followers to take immediate action, there are obviously major differences in their ability to enforce such action. One has a large army and police force to manually implement action, while the other has the moral authority of being traditionally considered a successor to Saint Peter to whom Jesus gave the keys to heaven. I will focus this blog on Pope Francis. When it comes to my own religion, I fast during Yom Kippur, but I don’t go to pray in a synagogue. I observe all the Jewish holidays – most of them with my family, but I don’t follow many of the dogmas of the Jewish religion in my daily life, such as those pertaining to food restrictions and driving and working on Saturdays. Many orthodox rabbis would not consider me to be a “real” Jew. To them, I am a “soft” Jew, even though during the Holocaust the Nazis marked me as a Jew by murdering most of my family. Similarly, many of the 1.2 billion Catholics are “soft” Catholics. They go to Church as often as they wish. They obey certain parts of the Catholic dogma and ignore others such as those regarding birth control and abortion. The Pope made two key speeches during his visit that contained strong language focused on global issues that are directly or indirectly related to climate change. His first – to the US Congress – was delivered in English, while his second – to the United Nations – was in Spanish. I will use Al Jazeera’s translation to quote some segments below. This presents us with great challenges and many hard decisions. On this continent, too, thousands of persons are led to travel north in search of a better life for themselves and for their loved ones, in search of greater opportunities. Is this not what we want for our own children? We must not be taken aback by their numbers, but rather view them as persons, seeing their faces and listening to their stories, trying to respond as best we can to their situation. To respond in a way which is always humane, just and fraternal. We need to avoid a common temptation nowadays: to discard whatever proves troublesome. Let us remember the Golden Rule: “Do unto others as you would have them do unto you” (Mt 7:12). The English translation of Pope Francis’ September 25 address to the United Nations, UN Headquarters, New York. Second, because every creature, particularly a living creature, has an intrinsic value, in its existence, its life, its beauty and its interdependence with other creatures. We Christians, together with the other monotheistic religions, believe that the universe is the fruit of a loving decision by the Creator, who permits man respectfully to use creation for the good of his fellow men and for the glory of the Creator; he is not authorised to abuse it, much less to destroy it. In all religions, the environment is a fundamental good (cf. ibid.). The misuse and destruction of the environment are also accompanied by a relentless process of exclusion. In effect, a selfish and boundless thirst for power and material prosperity leads both to the misuse of available natural resources and to the exclusion of the weak and disadvantaged, either because they are differently abled (handicapped), or because they lack adequate information and technical expertise, or are incapable of decisive political action. The ecological crisis, and the large-scale destruction of biodiversity, can threaten the very existence of the human species. The baneful consequences of an irresponsible mismanagement of the global economy, guided only by ambition for wealth and power, must serve as a summons to a forthright reflection on man: “man is not only a freedom which he creates for himself. Man does not create himself. He is spirit and will, but also nature” (BENEDICT XVI, Address to the Bundestag, 22 September 2011, cited in Laudato Si’, 6). Creation is compromised “where we ourselves have the final word… The misuse of creation begins when we no longer recognise any instance above ourselves, when we see nothing else but ourselves” (ID. Address to the Clergy of the Diocese of Bolzano-Bressanone, 6 August 2008, cited ibid.). Consequently, the defence of the environment and the fight against exclusion demand that we recognize a moral law written into human nature itself, one which includes the natural difference between man and woman (cf. Laudato Si’, 155), and absolute respect for life in all its stages and dimensions (cf. ibid., 123, 136). The picture below shows the Pope speaking to Congress. Behind the Pope are the two co-chairs of this joint session of Congress, Speaker Boehner and Vice-President Biden in his role as President of the Senate. Both are practicing Catholics. Speaker Boehner is a Republican while VP Biden is a Democrat. The two disagree on almost everything, a feeling that especially applies to the issue of abortion. Pope Francis referred to that matter peripherally when he said, “The Golden Rule also reminds us of our responsibility to protect and defend human life at every stage of its development.” Vice President Biden supports Federal law following the landmark Roe v. Wade Supreme Court decision, which gives a woman the right to choose with some restrictions. Speaker Boehner wants to ban all abortion in the country. On this subject, the Catholic Church, with the Pope’s support, agrees with Speaker Boehner. Vice President Joe Biden, a Roman Catholic, said that while he accepts the Church’s position that life begins at conception, he will not share his position with others who do not have the same beliefs. “I’m prepared to accept that at the moment of conception there’s human life and being, but I’m not prepared to say that to other God­-fearing, non-­God­ fearing people that have a different view,” Biden told Father Matt Malone, S.J., editor in chief of America magazine, in an interview published on Monday. Speaker Boehner has made the announcement that he will resign from Congress at the end of October. Whether his resignation is connected to the conflict between the Pope’s recent teachings and his own religious and political beliefs remains to be determined. Certainly, he – along with many other Republican elected officials – has expressed strong disagreement with and disapproval of the Pope’s continued messages on climate change and other global issues. In the next month or two, with the advantage of extra time to reflect and react, I will try to remove some of the pageantry from the discussion of this week’s events and try to examine some of the key actions and consequences that result. This entry was posted in Climate Change and tagged Abortion, Adaptation, Catholic, China, choice, Clean Energy, Climate Change, Climate Change Denial, Climate Change Deniers, Climate Skeptics, Congress, Democrat, Democratization, ecology, Global Population, golden rule, Jew, Jewish, Nature, Paris, Pope, Pope Francis, Population, Republican, responsibility, Roe v. Wade, Science, Sustainability, UN, United Nations, US, World Population, World Summit, Xi Jinping, Yom Kippur. Bookmark the permalink. Hi Professor Tomkiewicz, I am a student in your Core Curriculum 3302 class. I really enjoy reading the post from your blog. I wanted to say how I’m sorry to hear that your family was murdered by the Nazis in the Holocaust. I always want to state that I like how you wrote down the Pope’s speech and that he mentioned the Golden Rule: “Do unto others as you would have them do unto you” (Mt 7:12). I feel that everyone should keep this golden rule inside of them and be humble in life because you never know when you might need help in the future. Its always better to have a friend than enemy.